Best Propane Patio Heater Reviews: Check out these top 8 choices! Staying warm outdoors while reading your favorite book or sipping your favorite drink on your patio gives you several options. One is to feel cozy in a sweater or a hoodie, or you can opt to place a propane patio heater as a source of heat— your choice. But we prefer the latter as the best propane patio heater can be a great patio decor during parties. It’s a great way to impress guests, don’t you think? Below are our top propane patio heater recommendations to get the best value of your money. 1 What Is a Propane Heater? Propane heater is a type of heater that uses manufactured gas, which is stored as a liquid in a tank. It basically works the same as your average methane gas heaters, but propane delivers more BTUs or heating power than a natural gas such as methane. To know more about propane heater consumer safety, read this consumer guide from the Propane Education & Research Council. Click Here. Keeping in line with a seamless and chill atmosphere, this tall quartz glass tube propane patio heater is a perfect choice. The pyramid shape structure offers an exciting contrast to the natural elements found outdoors. With 7.5 feet height, manufacturers of this propane heater made sure to build it with durability in mind. This is made with steel and aluminum as its prime materials; both of which are high-grade and weather-resistant. If your patio has about 15 feet diameter space, then this heater’s power of 40,000 BTU should be enough to heat the entire area. You can use it up to 10 long hours with just 20 pounds of propane. Praised for its space-saving design, this propane patio heater is a regular in an open restaurant scene. Pack with 46,000 BTU heating power, this can heat up areas within the 18-feet diameter range. It stands at 7.4 feet but with a slim structure, thus can easily fits small space. Just be careful in putting it close or under a wooden beam or structure since it is quite tall and may cause a fire. In terms of heating power duration, this propane patio heater by Fire Sense can last 10 hours of power. This power duration is only achieved once the 20-pound gallon tank is filled. The best thing about this product is its color options, so you’ll surely find the best model that complements well with your patio decor. Lo and behold! One of the most delightful best propane patio heaters on the list is this 46,000 BTU Lamarr model by Mercury Row. We are instantly drawn by its turquoise powder coating. Moreover, we love its slim and tall structure, perfect for small patios and outdoor spaces. 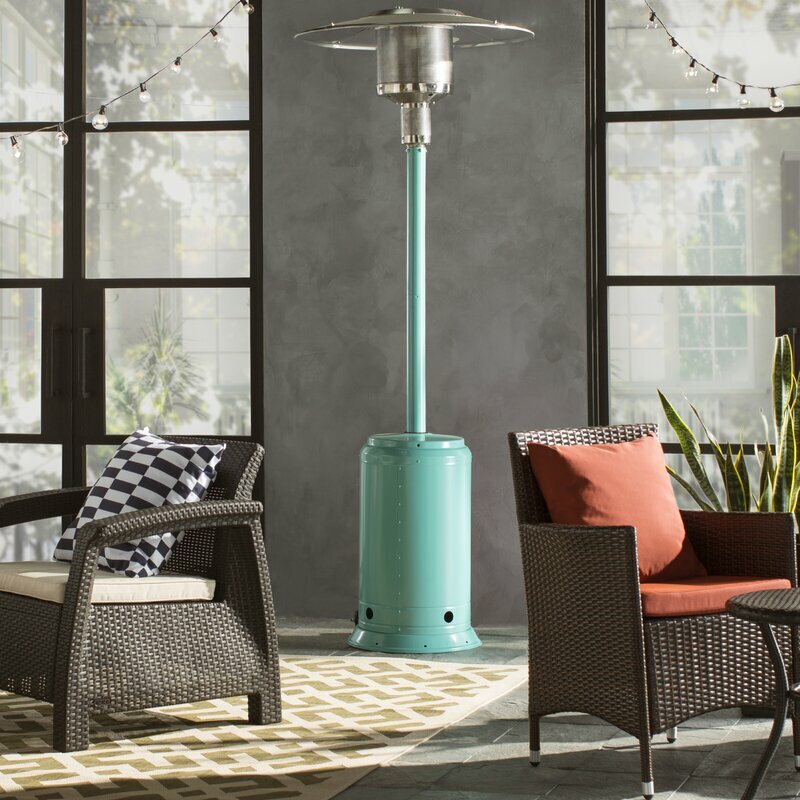 This Brooklyn style propane patio heater boasts a heating rage of up to 18 feet diameter and an ignition type of Piezo ignition. Add 20 pounds of propane, and you can use it for as long as 10 hours. 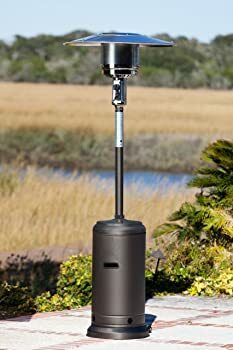 This steel propane patio heater with black finish is one of the cheapest propane heaters on the list. This model has a hammered steel construction, making it both fashionable and durable. Powered by 47,000 BTU heating power, this propane heater can consume 20 pounds of liquid propane before it runs out. Put it at the center of your 10 feet diameter patio garden, and you can already add warmth to the surroundings. We love the minimalist look and color of this liquid propane heater. Moreso with the fact that it reaches 7.4 feet height, perfect for high ceiling covered patios. With the fall season approaching, it’s the perfect time to get a new propane patio heater for a chill night chat outside or a barbeque party. 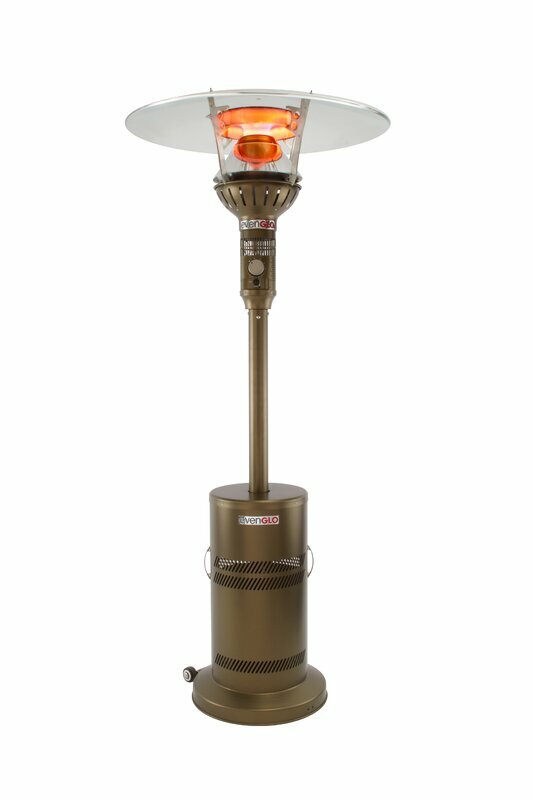 Golden Flame propane patio heater is specifically designed to complement the outdoor setting and atmosphere. One quality to look for in the best propane patio heater is how much heating power it has. This particular model has a total of 46,000 BTU heating power, which is quite impressive considering that other models offer a lower heating power at a more expensive rate. Another one of our propane patio heater favorites is this 46,000 BTU propane heater by AmazonBasics. One thing that’s exciting about this model is that it tricks you to think it is a plain black-colored propane heater, but once the sun dazzled on it, this particular model reveals its Havana Bronze finish. Durable, affordable, and practical are three qualities you’ll love about this propane heater model, not to mention its soothing warm heat that will instantly make you and your family comfortable. You know you hit the jackpot with this hammered Bronze Premium Propane Patio Heater by Belleze. We love the Bronze finish as it easily matches varnished furniture pieces in patios and decks. Just add sand or water to the weight bladder to stabilize it, and you can already put this heater outdoors. Suppose you want to read outdoors but don’t want to get too close to your siblings to focus on your activity; well, this propane heater is the perfect pick. It has a total of 48,000 BTU heating power that is suitable for a 175-square feet space with 15 to 18 feet diameter radius. A heater that heats almost twice the radius of its closest competitor? Why not! Introducing the Evenglo Propane Heater by IR Energy. This model boasts a total of 47,000 BTU heating power that can cover about 50% more heating radius. This Canadian-made propane heater model features a rubber weighted base plate which we love, along with its sleek and contemporary look. 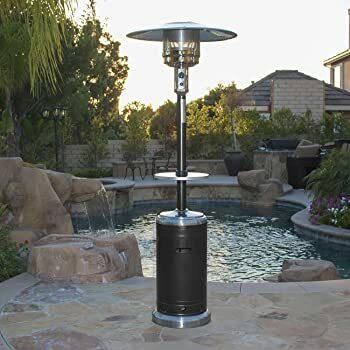 Not only is a propane patio heater provides warmth to your outdoor patio, it also serves as a great outdoor decor during parties and family bondings. Owning one is a smart decision, especially if you are the type of person who loves to spend most of your “me-time” on your patio. Among the heaters on the list, we have three criteria in mind when choosing the best propane patio heater: 1) Functionality, 2) Design and Structure, and 3) Affordability. And the best model that fits these criteria is none other than the AmazonBasics 46,000 BTU Havana Bronze Commercial Propane Heater. This outdoor propane heater is priced reasonably but doesn’t fall short in functional features such as Piezo Ignition System, heat control knob, and wheels. We also commend its Bronze finish that fits well with patio furniture and its sturdy base that prevents the heater from getting toppled easily. Overall, we think the propane patio heater by Amazonbasics offers the best value among the heaters listed. It is durable, has all the basic features you would want in a propane patio heater, and is offered at a very affordable price.